Salads are such healthy recipes and very filling especially when you add freshly grilled chicken! Try this high-protein Mexican Chicken Salad with tomatoes and wrapped in a tortilla for something different. For the chicken breast, season it with salt, and pepper. Cook in a skillet over medium-high heat until well done. Remove from heat and set it aside. For the salad, in a bowl mix together the lettuce and onions. Drizzle the olive oil and lime juice. Sprinkle with salt and pepper and add the oregano. Mix well. Add the avocado and the chicken breast. Top with the pistachios and lightly sprinkle the parmesan cheese. For a spicy kick add red pepper flakes and paprika. 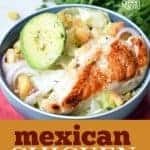 This looks delish and is so different that I can not wait to add it to my summer meal rotation! Thanks for linking up this healthy recipe with us at #overthemoon. I’ve pinned and shared. This sounds really good – a great summer dinner! Thanks for sharing on the What’s for Dinner link up! 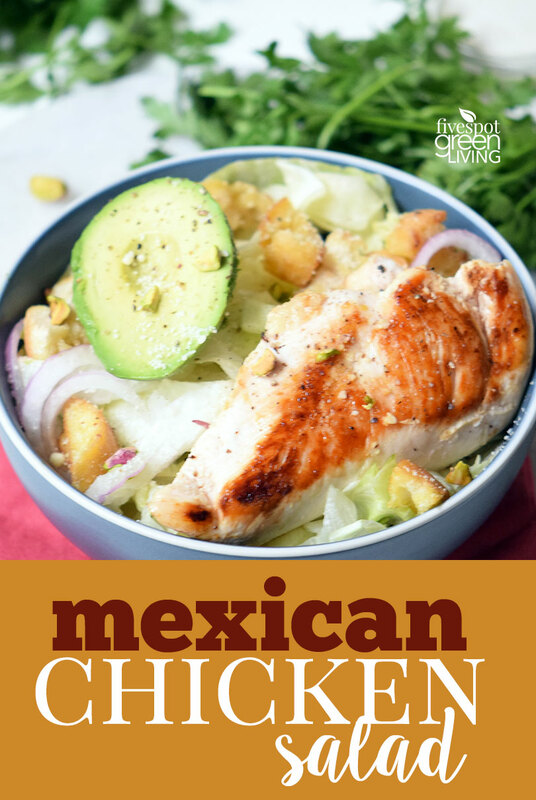 Your Mexican Chicken Salad looks amazing! Hope you are having a fantastic week and thanks so much for sharing with us at Full Plate Thursday. We will look forward to seeing you again real soon! I know my family will love this salad and I love that it’s a healthier option. Congrats, you’re featured this week at the This Is How We Roll Link Party. Thanks Susan! I’m headed over there now.